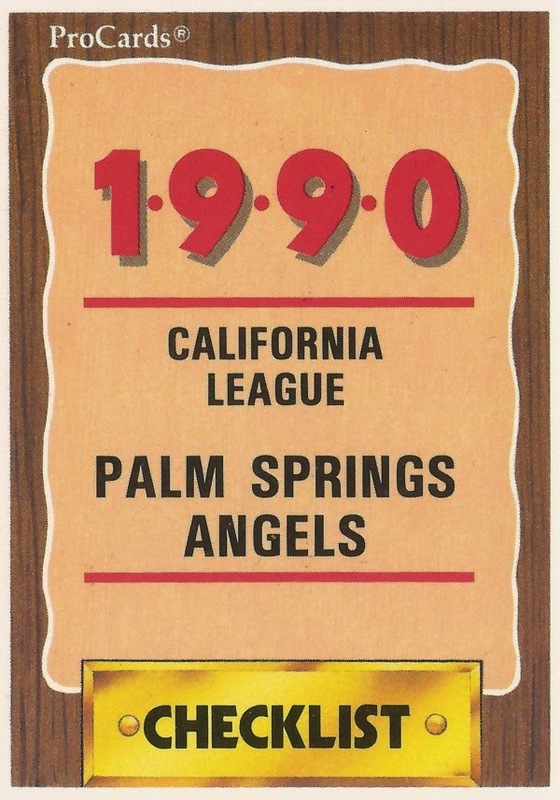 Features on each member of the 1990 Palm Springs Angels, single-A affiliate of the California Angels. Clemente Acosta finished off a single-A save in 1988. He never made the bigs. Terry Carr was called a Gary Pettis-type. He never made the bigs. Marvin Cobb picked up a short-season win. He made AA, but not the bigs. 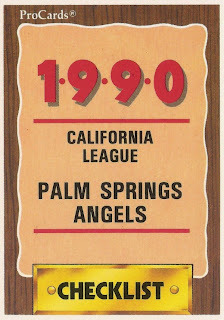 Frank Dominguez guessed right, hit a high school home run. Steve Dunn gave up one run in a college outing. He played three pro seasons. John Fritz tried to leave them with a good impression. Jeff Kelso made a fastball the game-winner at short-season. He never made AA. Jeff Kipila felt more comfortable at the plate. He made AAA, but not the bigs. Brett Merriman used his control for a high school no-hitter. He made the bigs in two seasons. David Martinez played eight seasons as a pro. He never made the bigs. Larry Pardo has played, coached and scouted in pro ball. Richard Parker got a big hit early. He later tried pitching. He never made AA. Dave Partrick started in the outfield. He then moved to pitching. He never made AA. Beban Perez helped his independent team to a big win in 1995. J.R. Phillips did what he did, made seven ML seasons. Kernan Ronan had great expertise as a minor league coach. Tim Salmon knew the situation and he knew it was big. Mike Search brought positive energy to his high school team. He never made AA. Catcher Dave Sturdivant once threw out three runners in a game. He never made AAA. Terry Taylor had big hopes out of college. He never made it above AA. Brandy Vann started over. He hoped he'd make the bigs. He never made it. Don Vidmar threw a high-A no-hitter. He played five seasons, not in the bigs. Tim Wallace's pro career lasted longer than a decade. He never made the bigs. Wally Warrecker threw a complete game in college. He played two seasons as a pro.